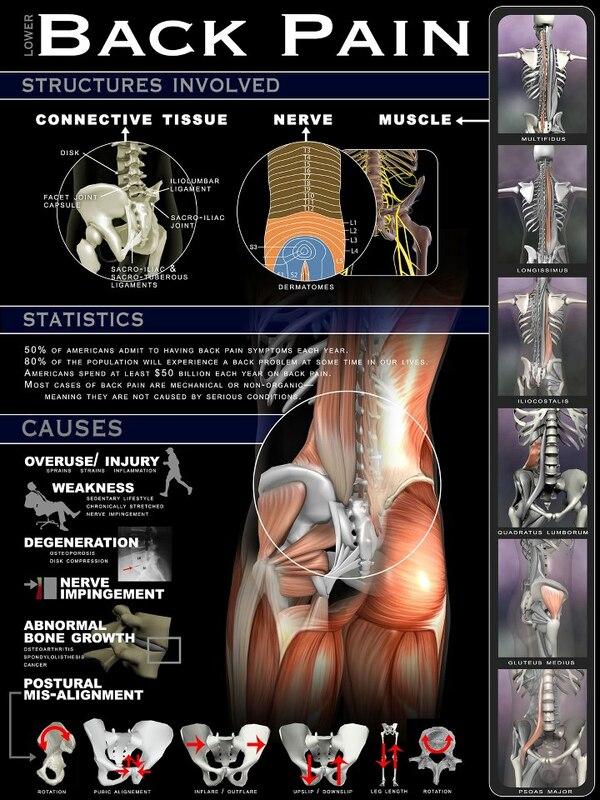 If you have lower back pain, you are not alone. Nearly everyone at some point has back pain that interferes with work, routine daily activities, or recreation. Americans spend at least $50 billion each year on low back pain, the most common cause of job-related disability and a leading contributor to missed work. Back pain is the second most common neurological ailment in the United States - only headache is more common. Fortunately, most occurrences of low back pain go away within a few days. Others take much longer to resolve or lead to more serious conditions. Acute or short-term low back pain generally lasts from a few days to a few weeks. Most acute back pain is mechanical in nature - the result of trauma to the lower back or a disorder such as vertebral subluxation. Pain from trauma may be caused by a sports injury, work around the house or in the garden, or a sudden jolt such as a car accident or other stress on spinal bones and tissues. Symptoms may range from muscle ache to shooting or stabbing pain, limited flexibility and/or range of motion, or an inability to stand straight. Occasionally, pain felt in one part of the body may "radiate" from a disorder or injury elsewhere in the body. Some acute pain syndromes can become more serious if left untreated. Chronic back pain is measured by duration - pain that persists for more than 3 months is considered chronic. It is often progressive and the cause can be difficult to determine. What structures make up the back? The back is an intricate structure of bones, muscles, and other tissues that form the posterior part of the body's trunk, from the neck to the pelvis. The centerpiece is the spinal column, which not only supports the upper body's weight but houses and protects the spinal cord - the delicate nervous system structure that carries signals that control the body's movements and convey its sensations. Stacked on top of one another are more than 30 bones - the vertebrae - that form the spinal column, also known as the spine. Each of these bones contains a roundish hole that, when stacked in register with all the others, creates a channel that surrounds the spinal cord. The spinal cord descends from the base of the brain and extends in the adult to just below the rib cage. Small nerves ("roots") enter and emerge from the spinal cord through spaces between the vertebrae. Because the bones of the spinal column continue growing long after the spinal cord reaches its full length in early childhood, the nerve roots to the lower back and legs extend many inches down the spinal column before exiting. This large bundle of nerve roots was dubbed by early anatomists as the cauda equina, or horse's tail. The spaces between the vertebrae are maintained by round, spongy pads of cartilage called intervertebral discs that allow for flexibility in the lower back and act much like shock absorbers throughout the spinal column to cushion the bones as the body moves. Bands of tissue known as ligaments and tendons hold the vertebrae in place and attach the muscles to the spinal column. The lumbar region of the back, where most back pain is felt, supports the weight of the upper body. Low back pain may reflect nerve or muscle irritation or bone lesions. Most low back pain follows injury or trauma to the back, but pain may also be caused by degenerative conditions such as arthritis or disc disease, osteoporosis or other bone diseases, viral infections, irritation to joints and discs, or congenital abnormalities in the spine. Obesity, smoking, weight gain during pregnancy, stress, poor physical condition, posture inappropriate for the activity being performed, and poor sleeping position also may contribute to low back pain. Additionally, scar tissue created when the injured back heals itself does not have the strength or flexibility of normal tissue. Buildup of scar tissue from repeated injuries eventually weakens the back and can lead to more serious injury. Low back pain unrelated to injury or other known cause is unusual in pre-teen children. However, a backpack overloaded with schoolbooks and supplies can quickly strain the back and cause muscle fatigue. The U.S. Consumer Product Safety Commission estimates that more than 13,260 injuries related to backpacks were treated at doctors' offices, clinics, and emergency rooms in the year 2000. To avoid back strain, children carrying backpacks should bend both knees when lifting heavy packs, visit their locker or desk between classes to lighten loads or replace books, or purchase a backpack or airline tote on wheels. What conditions are associated with low back pain? Sciatica is a condition in which a herniated or ruptured disc presses on the sciatic nerve, the large nerve that extends down the spinal column to its exit point in the pelvis and carries nerve fibers to the leg. This compression causes shock-like or burning low back pain combined with pain through the buttocks and down one leg to below the knee, occasionally reaching the foot. In the most extreme cases, when the nerve is pinched between the disc and an adjacent bone, the symptoms involve not pain but numbness and some loss of motor control over the leg due to interruption of nerve signaling. The condition may also be caused by a tumor, cyst, metastatic disease, or degeneration of the sciatic nerve root. Spinal degeneration from disc wear and tear can lead to a narrowing of the spinal canal. A person with spinal degeneration may experience stiffness in the back upon awakening or may feel pain after walking or standing for a long time. Spinal stenosis related to congenital narrowing of the bony canal predisposes some people to pain related to disc disease. Osteoporosis is a metabolic bone disease marked by progressive decrease in bone density and strength. Fracture of brittle, porous bones in the spine and hips results when the body fails to produce new bone and/or absorbs too much existing bone. Women are four times more likely than men to develop osteoporosis. Caucasian women of northern European heritage are at the highest risk of developing the condition. Skeletal irregularities produce strain on the vertebrae and supporting muscles, tendons, ligaments, and tissues supported by spinal column. These irregularities include scoliosis, a curving of the spine to the side; kyphosis, in which the normal curve of the upper back is severely rounded; lordosis, an abnormally accentuated arch in the lower back; back extension, a bending backward of the spine; and back flexion, in which the spine bends forward. Fibromyalgia is a chronic disorder characterized by widespread musculoskeletal pain, fatigue, and multiple "tender points," particularly in the neck, spine, shoulders, and hips. Additional symptoms may include sleep disturbances, morning stiffness, and anxiety. A thorough medical history and physical exam can usually identify any dangerous conditions or family history that may be associated with the pain. The patient describes the onset, site, and severity of the pain; duration of symptoms and any limitations in movement; and history of previous episodes or any health conditions that might be related to the pain. The physician will examine the back and conduct neurologic tests to determine the cause of pain and appropriate treatment. X-ray imaging includes conventional and enhanced methods that can help diagnose the cause and site of back pain. A conventional x-ray, often the first imaging technique used, looks for broken bones or an injured vertebra. An x-ray taken of the back can, within minutes, clearly show the bony structure and any vertebral misalignment or fractures. This fast, noninvasive, painless procedure is usually performed in a doctor's office or at a clinic. Computerized tomography (CT) is a quick and painless process used when disc rupture, spinal stenosis, or damage to vertebrae is suspected as a cause of low back pain. X-rays are passed through the body at various angles and are detected by a computerized scanner to produce two-dimensional slices (1 mm each) of internal structures of the back. This diagnostic exam is generally conducted at an imaging center or hospital. Magnetic resonance imaging (MRI) is used to evaluate the lumbar region for bone degeneration or injury or disease in tissues and nerves, muscles, ligaments, and blood vessels. MRI scanning equipment creates a magnetic field around the body strong enough to temporarily realign water molecules in the tissues. Radio waves are then passed through the body to detect the "relaxation" of the molecules back to a random alignment and trigger a resonance signal at different angles within the body. A computer processes this resonance into either a three-dimensional picture or a two-dimensional "slice" of the tissue being scanned, and differentiates between bone, soft tissues and fluid-filled spaces by their water content and structural properties. This noninvasive procedure is often used to identify a condition requiring prompt surgical treatment. Electrodiagnostic procedures include electromyography (EMG), nerve conduction studies, and evoked potential (EP) studies. EMG assesses the electrical activity in a nerve and can detect if muscle weakness results from injury or a problem with the nerves that control the muscles. Very fine needles are inserted in muscles to measure electrical activity transmitted from the brain or spinal cord to a particular area of the body. With nerve conduction studies the doctor uses two sets of electrodes (similar to those used during an electrocardiogram) that are placed on the skin over the muscles. The first set gives the patient a mild shock to stimulate the nerve that runs to a particular muscle. The second set of electrodes is used to make a recording of the nerve's electrical signals, and from this information the doctor can determine if there is nerve damage. EP tests also involve two sets of electrodes - one set to stimulate a sensory nerve and the other set on the scalp to record the speed of nerve signal transmissions to the brain. Bone scans are used to diagnose and monitor infection, fracture, or disorders in the bone. A small amount of radioactive material is injected into the bloodstream and will collect in the bones, particularly in areas with some abnormality. Scanner-generated images are sent to a computer to identify specific areas of irregular bone metabolism or abnormal blood flow, as well as to measure levels of joint disease. Thermography involves the use of infrared sensing devices to measure small temperature changes between the two sides of the body or the temperature of a specific organ. Thermography may be used to detect the presence or absence of nerve root compression. Ultrasound imaging, also called ultrasound scanning or sonography, uses high-frequency sound waves to obtain images inside the body. The sound wave echoes are recorded and displayed as a real-time visual image. Ultrasound imaging can show tears in ligaments, muscles, tendons, and other soft tissue masses in the back. Most low back pain can is successfully treated without surgery. Treatment involves using chiropractic spinal manipulation that's goal is to reduce inflammation, restore proper function and strength to the back, and prevent recurrence of the injury. Most patients with back pain recover without residual functional loss. Patients should contact a doctor if there is not a noticeable reduction in pain and inflammation after 48 hours of self-care. Spinal manipulation is literally a "hands-on" approach in which professionally licensed chiropractors use leverage and a series of exercises to adjust spinal structures and restore back mobility. The term "adjustment" refers to the specific manipulation chiropractors apply to vertebrae that have abnormal movement patterns or fail to function normally. The objective of the chiropractic treatment is to reduce the subluxation, which results in an increased range of motion, reduced nerve irritability and improved function. The adjustment made by the chiropractor consists of a high velocity, short lever arm thrust applied to a vertebra, which is often accompanied by an audible release of gas (joint cavitation). The audible sound is caused by the release of oxygen, nitrogen, and carbon dioxide, which releases joint pressure (cavitation). The sensation is usually relieving, though minor discomfort has been reported (that usually lasts for only a short time duration) if the surrounding muscles are in spasm or the patient tenses up during the chiropractic procedure. Acupuncture involves the insertion of needles the width of a human hair along precise points throughout the body. Practitioners believe this process triggers the release of naturally occurring painkilling molecules called peptides and keeps the body's normal flow of energy unblocked. Clinical studies are measuring the effectiveness of acupuncture in comparison to more conventional procedures in the treatment of acute low back pain. Traction involves the use of weights to apply constant or intermittent force to gradually "pull" the skeletal structure into better alignment. Traction is not recommended for treating acute low back symptoms. Transcutaneous electrical nerve stimulation (TENS) is administered by a battery-powered device that sends mild electric pulses along nerve fibers to block pain signals to the brain. Small electrodes placed on the skin at or near the site of pain generate nerve impulses that block incoming pain signals from the peripheral nerves. TENS may also help stimulate the brain's production of endorphins (chemicals that have pain-relieving properties). Ultrasound is a noninvasive therapy used to warm the body's internal tissues, which causes muscles to relax. Sound waves pass through the skin and into the injured muscles and other soft tissues. Often ice and heat (the use of cold and hot compresses) are used to help resolve low back injury, by reducing pain and inflammation and allow greater mobility for some individuals. As soon as possible following trauma, patients should apply a cold pack or a cold compress (such as a bag of ice or bag of frozen vegetables wrapped in a towel) to the tender spot several times a day for up to 20 minutes. After 2 to 3 days of cold treatment, they should then apply heat (such as a heating lamp or hot pad) for brief periods to relax muscles and increase blood flow. Warm baths may also help relax muscles. Patients should avoid sleeping on a heating pad, which can cause burns and lead to additional tissue damage. Bed rest - 1-2 days at most. A 1996 Finnish study found that persons who continued their activities without bed rest following onset of low back pain appeared to have better back flexibility than those who rested in bed for a week. Other studies suggest that bed rest alone may make back pain worse and can lead to secondary complications such as depression, decreased muscle tone, and blood clots in the legs. Patients should resume activities as soon as possible. At night or during rest, patients should lie on one side, with a pillow between the knees (some doctors suggest resting on the back and putting a pillow beneath the knees). Exercise may be an effective way to help recover from low back pain and help strengthen back and abdominal muscles. Maintaining and building muscle strength is particularly important for persons with skeletal irregularities. Your chiropractor can provide a list of gentle exercises that help keep muscles moving and speed the recovery process. A routine of back-healthy activities may include stretching exercises, swimming, walking, and movement therapy to improve coordination and develop proper posture and muscle balance. Yoga is another way to gently stretch muscles and ease pain. Any mild discomfort felt at the start of these exercises should disappear as muscles become stronger. But if pain is more than mild and lasts more than 15 minutes during exercise, patients should stop exercising and contact a doctor. Medications are often over-used to treat acute and chronic low back pain. Effective pain relief may involve a combination of prescription drugs and over-the-counter remedies. Patients should always check with a doctor before taking drugs for pain relief. Certain medicines, even those sold over the counter, are unsafe for more than acute injuries, may conflict with other medications, may cause side effects including drowsiness, or may lead to liver damage. Over-the-counter analgesics, including nonsteroidal anti-inflammatory drugs (aspirin, naproxen, and ibuprofen), are taken orally to reduce stiffness, swelling, and inflammation and to ease mild to moderate low back pain. Counter-irritants applied topically to the skin as a cream or spray stimulate the nerve endings in the skin to provide feelings of warmth or cold and dull the sense of pain may be as effective as oral medications. Topical analgesics can also reduce inflammation and stimulate blood flow. Many of these compounds contain salicylates, the same ingredient found in oral pain medications containing aspirin. Opioids such as codeine, oxycodone, hydrocodone, and morphine are often prescribed to manage severe acute and chronic back pain but should be used only for a short period of time and under a physician's supervision. Side effects can include drowsiness, decreased reaction time, impaired judgment, and potential for addiction. Many specialists are convinced that chronic use of these drugs is detrimental to the back pain patient, adding to depression and even increasing pain. In the most serious cases, when the condition does not respond to other therapies, risky surgery may relieve pain caused by back problems or serious musculoskeletal injuries. Some surgical procedures may be performed in a doctor's office under local anesthesia, while others require hospitalization. It may be months following surgery before the patient is fully healed, and he or she may suffer permanent loss of flexibility. Since invasive back surgery is not always successful, it should be thoughtfully considered and performed only in patients with progressive neurologic disease or damage to the peripheral nerves. Discectomy is one of the more common ways to remove pressure on a nerve root from a bulging disc or bone spur. During the procedure the surgeon takes out a small piece of the lamina (the arched bony roof of the spinal canal) to remove the obstruction below. Foraminotomy is an operation that "cleans out" or enlarges the bony hole (foramen) where a nerve root exits the spinal canal. Bulging discs or joints thickened with age can cause narrowing of the space through which the spinal nerve exits and can press on the nerve, resulting in pain, numbness, and weakness in an arm or leg. Small pieces of bone over the nerve are removed through a small slit, allowing the surgeon to cut away the blockage and relieve the pressure on the nerve. IntraDiscal Electrothermal Therapy (IDET) uses thermal energy to treat pain resulting from a cracked or bulging spinal disc. A special needle is inserted via a catheter into the disc and heated to a high temperature for up to 20 minutes. The heat thickens and seals the disc wall and reduces inner disc bulge and irritation of the spinal nerve. Nucleoplasty uses radiofrequency energy to treat patients with low back pain from contained, or mildly herniated, discs. Guided by x-ray imaging, a wand-like instrument is inserted through a needle into the disc to create a channel that allows inner disc material to be removed. The wand then heats and shrinks the tissue, sealing the disc wall. Several channels are made depending on how much disc material needs to be removed. Radiofrequency lesioning is a procedure using electrical impulses to interrupt nerve conduction (including the conduction of pain signals) for 6 to12 months. Using x-ray guidance, a special needle is inserted into nerve tissue in the affected area. Tissue surrounding the needle tip is heated for 90-120 seconds, resulting in localized destruction of the nerves. Spinal fusion is used to strengthen the spine and prevent painful movements. The spinal disc(s) between two or more vertebrae is removed and the adjacent vertebrae are "fused" by bone grafts and/or metal devices secured by screws. Spinal fusion may result in some loss of flexibility in the spine and requires a long recovery period to allow the bone grafts to grow and fuse the vertebrae together. Spinal laminectomy (also known as spinal decompression) involves the removal of the lamina (usually both sides) to increase the size of the spinal canal and relieve pressure on the spinal cord and nerve roots. Other surgical procedures to relieve severe chronic pain include rhizotomy, in which the nerve root close to where it enters the spinal cord is cut to block nerve transmission and all senses from the area of the body experiencing pain; cordotomy, where bundles of nerve fibers on one or both sides of the spinal cord are intentionally severed to stop the transmission of pain signals to the brain; and dorsal root entry zone operation, or DREZ, in which spinal neurons transmitting the patient's pain are destroyed surgically. Recurring back pain resulting from improper body mechanics or other nontraumatic causes is often preventable. A combination of exercises that don't jolt or strain the back, maintaining correct posture, and lifting objects properly can help prevent injuries. Many work-related injuries are caused or aggravated by stressors such as heavy lifting, contact stress (repeated or constant contact between soft body tissue and a hard or sharp object, such as resting a wrist against the edge of a hard desk or repeated tasks using a hammering motion), vibration, repetitive motion, and awkward posture. Applying ergonomic principles - designing furniture and tools to protect the body from injury - at home and in the workplace can greatly reduce the risk of back injury and help maintain a healthy back. More companies and homebuilders are promoting ergonomically designed tools, products, workstations, and living space to reduce the risk of musculoskeletal injury and pain. Following any period of prolonged inactivity, begin a program of regular low-impact exercises. Speed walking, swimming, or stationary bike riding 30 minutes a day can increase muscle strength and flexibility. Yoga can also help stretch and strengthen muscles and improve posture. Ask your physician or orthopedist for a list of low-impact exercises appropriate for your age and designed to strengthen lower back and abdominal muscles. Graeff Chiropractic Clinic maintains an active presence on many popular search websites. Select your favorite website below to stay connected & review us.